Yaghubi Beklar, S., Hamzeh, M., Talebpour Amiri*, F. (2017). Ameliorative effect of Zingiber officinale on diazinon -induced testicular toxicity: A biochemical, histopathological, and immunohistochemical study. 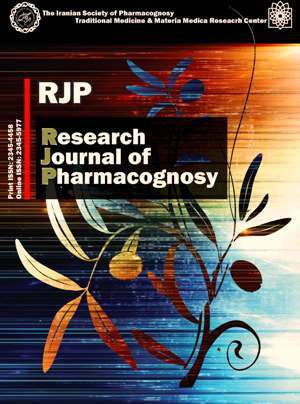 Research Journal of Pharmacognosy, 4(Supplement), 52-52. S. Yaghubi Beklar; M. Hamzeh; F. Talebpour Amiri*. "Ameliorative effect of Zingiber officinale on diazinon -induced testicular toxicity: A biochemical, histopathological, and immunohistochemical study". Research Journal of Pharmacognosy, 4, Supplement, 2017, 52-52. Yaghubi Beklar, S., Hamzeh, M., Talebpour Amiri*, F. (2017). 'Ameliorative effect of Zingiber officinale on diazinon -induced testicular toxicity: A biochemical, histopathological, and immunohistochemical study', Research Journal of Pharmacognosy, 4(Supplement), pp. 52-52. Yaghubi Beklar, S., Hamzeh, M., Talebpour Amiri*, F. Ameliorative effect of Zingiber officinale on diazinon -induced testicular toxicity: A biochemical, histopathological, and immunohistochemical study. Research Journal of Pharmacognosy, 2017; 4(Supplement): 52-52. 1Student Research Committee, Faculty of Medicine, Mazandaran University of Medical Sciences, Sari, Iran. Department of Toxicology, Faculty of Pharmacy, Mazandaran University of Medical Sciences, Sari, Iran. 2Student Research Committee, Faculty of Medicine, Mazandaran University of Medical Sciences, Sari, Iran. Department of Anatomy, Faculty of Medicine, Molecular and Cell Biology Research Center, Mazandaran University of Medical Sciences, Sari, Iran. 3Department of Anatomy, Faculty of Medicine, Molecular and Cell Biology Research Center, Mazandaran University of Medical Sciences, Sari, Iran. Background and objectives: Diazinon (O,O-diethyl O-2-isopropyl-6- methyl pyrimidinyl-4-g-1- phosphorothioate) is one of the organophosphate insecticides for different agricultural and gardening uses, which can be highly toxic. Zingiber officinale(ginger), a spice and herbal medicine, has antioxidant and anti-inflammatory properties. This study has investigated the effects of ginger against DZN-induced testicular toxicity. Methods: Thirty two adult male mice were randomly divided into four groups. The control group; ginger group (200 mg/kg); DZN group (10 mg/kg) and ginger + DZN group. Ginger and DZN were received for 30 consecutive days by gavage and DZN treat one hour after receiving ginger. Sperm parameters, testosterone levels, biochemical, histopathological and immunohistochemical assays of testis were evaluated. Results: The results revealed that treatment with DZN caused significant damage of sperm parameters (sperm motility, count, viability rate and abnormalities), increased oxidative stress (increased MDA and decreased GSH level), significant histopathological changes and decreased Johnsen’s Score, testosterone level and increased caspase-3 immunoreactivity. Ginger preserved sperm parameters and mitigated the toxic effects of DZN. Also, pretreatment with ginger significantly reduced caspase-3 immunoreactivity. Conclusion: Our results concluded that ginger probably with its antioxidant activity and scavenging free radicals protect against DZN-induced testicular toxicity.